Custom Shade Window Tinting is THE LEADER IN GLASS SECURITY IN SOUTHWEST MISSOURI!! Our experience began in 1998 in southern Florida, installing security film for hurricane protection. Bringing this knowledge and experience back to the Springfield, MO and all of the Midwest. Window protection is our expertise, we have installed security film in schools such as Marshfield, Rogersville, Ava, Mansfield, Willow Springs, Mountain Grove, Hollister, and many more. When security film is installed, it bonds tightly to the glass as well as binds the window together so that it is extremely difficult to penetrate. 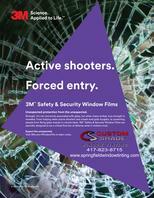 3M™ Ultra Series is micro-layered this increases the tear resistance for enhanced protection. 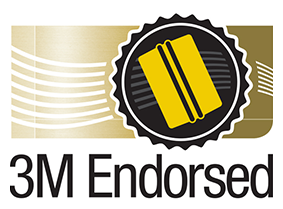 The 3M Ultra series has been approved by many municipalities to meet safety glazing codes and has past third-party testing of ANSI Z97.1. This film also helps protect people from air born or flying glass shards in the event of wind storms and explosions. With increasing riots, School shootings, and domestic terrorist glass security film can detour a bad guy or buy you that valuable time you need to take cover and protect your loved ones and your property. Alarm systems do a great job but they do not keep an intruder from just breaking the glass and climbing through the open window. Adding security film to your windows will at the very least slow down a robber so that the police have time to respond. Check out our Videos Or click on the buttons below for more info. Contact us today for a free estimate, and allow us the opportunity to show you how to make your building safe from intruders, storms, and unfortunate acts of terror. We offer demonstration for schools and municipalities, or any organization interested in security. Custom Shade also offers specs and information to all architects wanting knowledge of real world testing and experience.